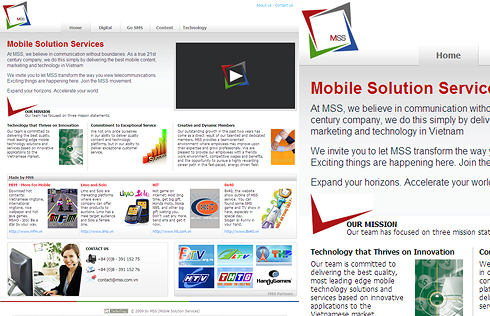 Founded in March 2006, Mobile Solution Services (MSS) offers high quality services in four different disciplines: mobile content; mobile technology; digital marketing; and SMS. The company is one of the four leading value-added service providers in Vietnam. Among its many advantages, MSS is the only partner in Vietnam with the exclusive rights to sell and distribute mobile music content from top global music labels EMI and Universal. MSS also distributes games from suppliers such as Fugumobile, Kaasa and Handy, and is the sole distributor of EA mobile games in Vietnam. The company recently launched MFM, a mobile content portal offering ringtones, wallpapers and Java games. In 2007, MMS won the prestigious Red Herring 100 Asia award as one of the top startup companies in Asia.